Wonder Woman vol. 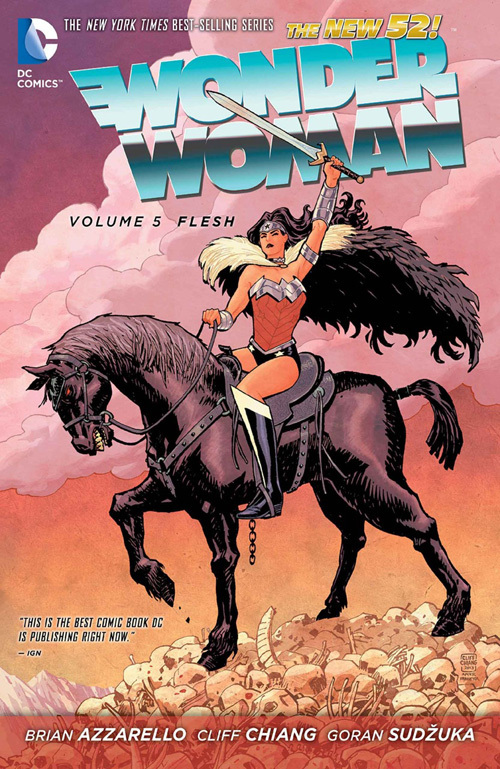 5: Flesh, DC Comics, 2014. Okay, I’ve avoided this long enough. 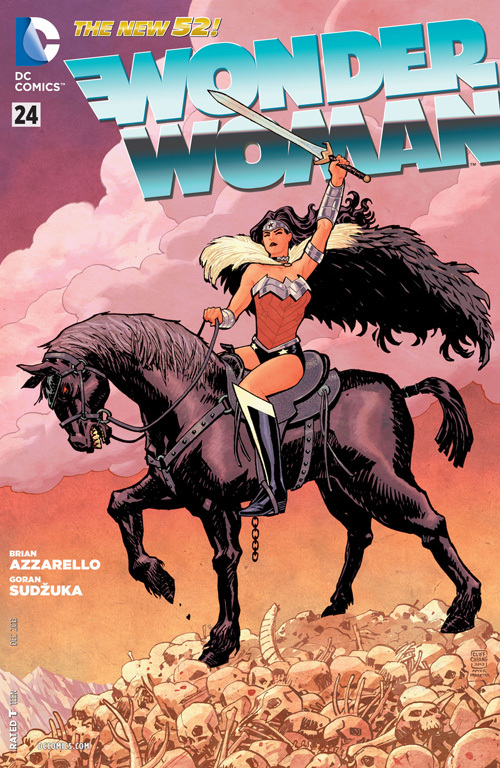 Let’s take a look at the penultimate volume of Brian Azzarello and Cliff Chiang’s New 52 reinvention of Wonder Woman, the run that ended a little over a month ago. 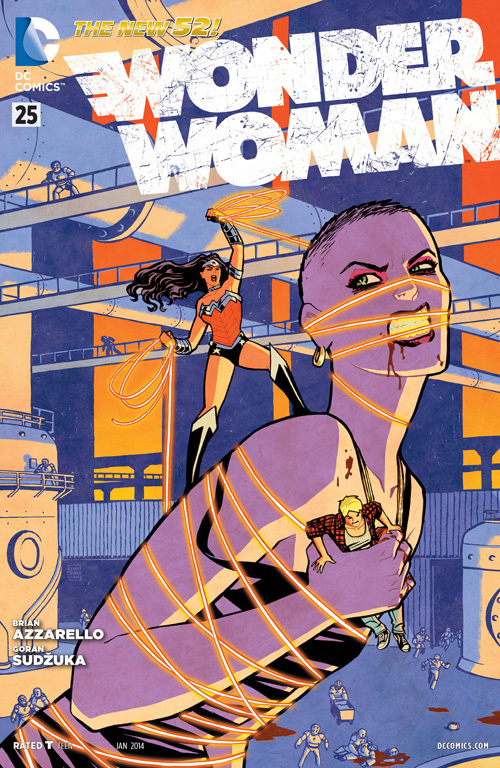 We’ve actually already talked about the first issue in this volume, the awkwardly numbered Wonder Woman #23.2, so let’s jump right in with issue 24. 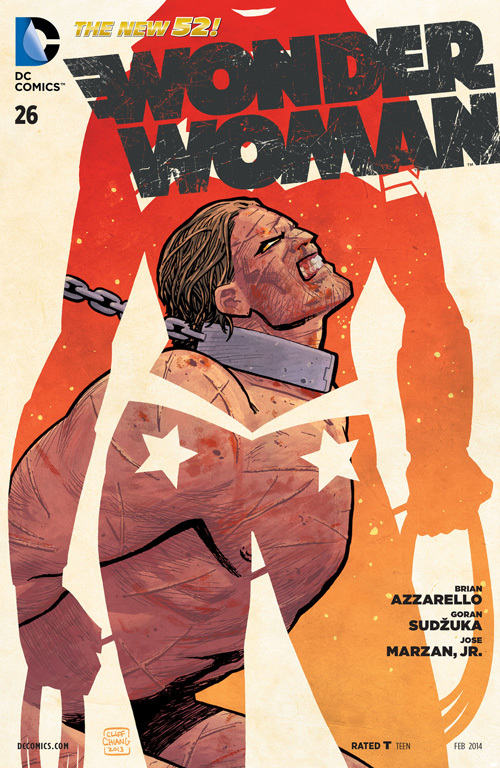 Wonder Woman #24, DC Comics, December 2013. One thing I don’t like about these collections of Azzarello’s run is that they don’t indicate who illustrated any individual issue, just the overall mix of artists. Anyway, this issue is drawn by Goran Sudzuka, who’d be doing the next couple of issues as well. Cliff Chiang was still the “main” artist on the series and doing all the covers, but it seems like he was drawing interiors less and less as the run went on. Sudzuka did some great work on the series while keeping a sort of stylistic continuity with Chiang’s work, though, so I can’t complain too much. So let’s see, what can I say about this issue? The main thing that happens—arguably the only thing that happens—is that Apollo summons Wonder Woman to Olympus to take her place as the new god of war (a role she inherited when she killed Ares), and she tells him she’s not interested. The rest is just details. It always cracks me up when she wears these white outfits reminiscent of her mod era. Among those details: The First Born is Apollo’s prisoner now, being casually tortured, and because the First Born is pledged and seemingly prophesied to kill Apollo and take over Olympus, that doesn’t really seem like it’s a situation that’s going to last too long. Hermes is the one sent to fetch Wonder Woman, of course, and she’s not too thrilled to see him, considering that the last time she saw him he’d betrayed her trust by stealing the baby that she was sworn to protect. He does make an awfully good point, however, by pointing out that she’s now perfectly chummy with Hera, who was initially the one that Hermes was trying to protect the baby from, as she was pretty dead set on killing the tyke at the time. 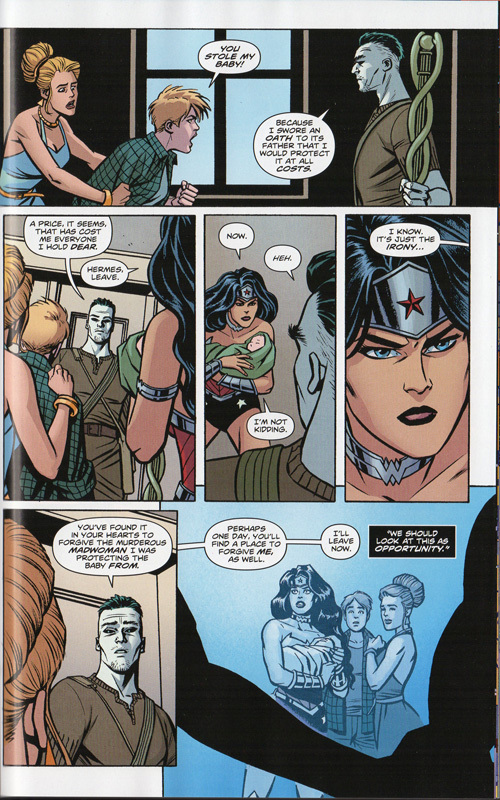 Speaking of Hera, who’s been stripped of her godhood, Wonder Woman tries to convince Apollo to reinstate her, but no dice. When Wondy basically rejects her place in Olympus, Apollo toys with the idea of not even having a god of war, despite the fact that war is clearly coming. And Strife, who seems pretty upset about the death of Ares—the only one who seems to care about it, actually, besides Wondy herself—is out for revenge on his killer. I’m sure that will work out well, too. Oh, and Milan, a blind hobo child of Zeus clearly modeled on the late musician Wesley Willis, falls into the clutches of his half-sister Cassandra, an ally of the First Born who’s always up to no good. I told you Strife was pissed. 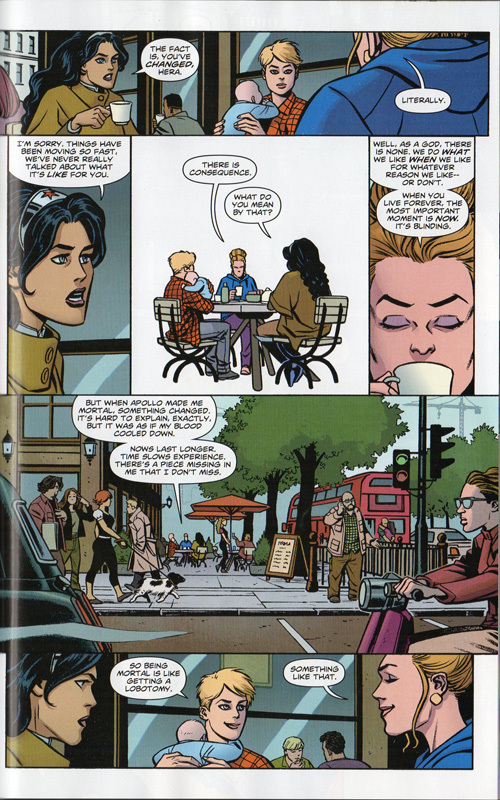 Wonder Woman #25, DC Comics, January 2014. So Strife’s out for revenge on Diana, and it’s no surprise that she goes about it in a weaselly way, showing up all sweetness and light and making undermining comments to poke at everybody’s worst sides. Beware of Greek gods bearing gifts. 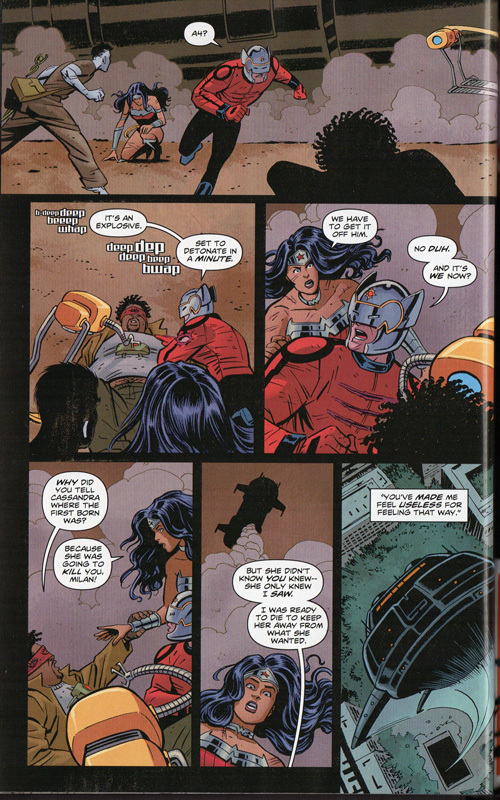 Strife has had Hephaestus forge her a weapon to use against Wonder Woman—a seemingly innocuous pin. Hera explains why she’s not a raging murder monster now and has actually become friends with her husband’s last lover (or at least the last one he fathered a child with—that we know of). Basically when you’re mortal and your actions actually have consequences, you chill out a bit. Sure, okay, I’ll buy that. Why not? 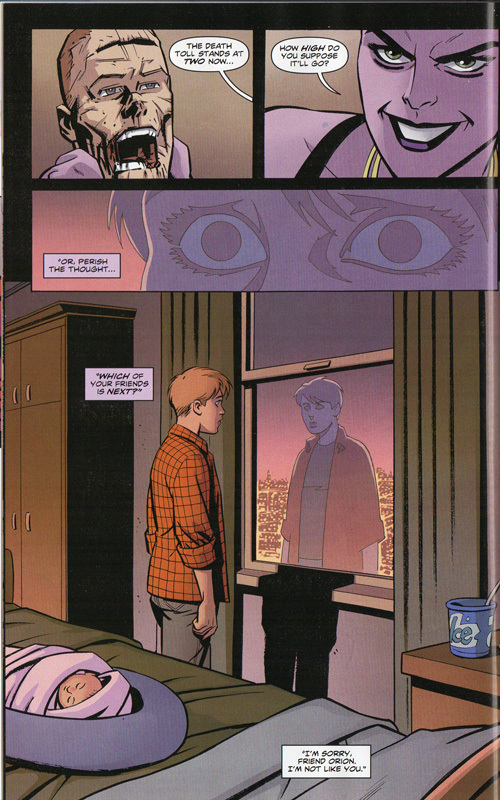 Hermes is just hanging out stalking Diana and pals—at least until Orion confronts him, when he comes out into the open. Oh, and Dionysus and Apollo are feasting on the First Born’s spleen while he’s still alive, because the gods are dicks. At least they’re classy about it. Meanwhile, Cassandra’s using Milan to help her find the baby and/or the First Born for her own nefarious purposes. As usual, Azzarello’s dialogue is borderline irritating, with lots of meaningless puns. (Who’s he talking to? Who… nose?”). I still don’t like his characterization of Orion, who’s been changed from a brooding, otherworldly demigod to a jock-fratboy type. When he hears that Milan’s been captured, Orion exclaims, “He’s a bud!” Seriously. That is a thing that happens. 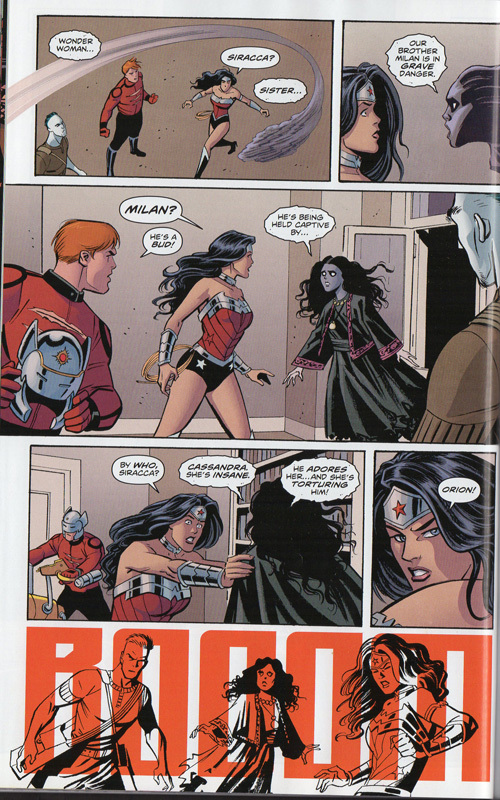 Oh, and when Diana, Orion and Hermes take off to rescue Milan, Wonder Woman leaves Strife in charge of Zola and her baby. That seems like a really excellent idea to me, what about you? I don’t really have much to say about this cover. It’s pretty nice. 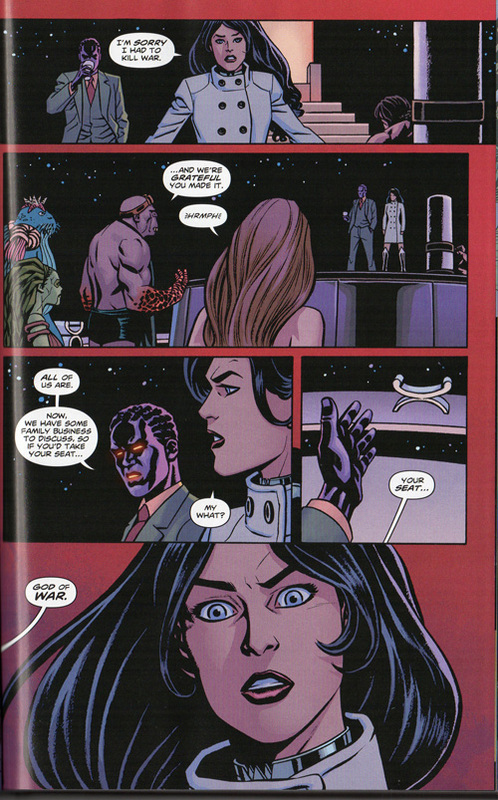 Wonder Woman #26, DC Comics, February 2014. OK, here again, what actually happens in this issue? Orion has gone to save Milan—in Chernobyl, no less—and so have Diana and Hermes, with the help of yet another child of Zeus, Siracca. Milan has some kind of magical seeing powers, even though he has no eyes and his sockets are full of maggots, so Cassandra is using him to find out where the First Born is. Only Milan says he’ll die before he tells. Diana can’t have that, so she goes ahead and tells Cassandra where the FB is being kept; I mean, what is Cassandra going to do, raid Olympus? Yeah, probably. So Cassandra takes off, leaving Milan with his rescuers. Oh, but there’s a bomb attached to Milan’s heart! So Orion has to rush him off to New Genesis to see if there’s anything that can be done about that. Rock over Olympus. Rock on, Chernobyl. Left with Zola and Zeke, Strife makes a bunch of cruelly insinuating comments that make Zola run away to avoid more people dying to protect her. And no sooner does Zola run away than she runs into Dionysus, who’s pretty consistently been shown as an ally of Apollo, who’s had it in for the baby since the beginning. So that can’t be good. Yeah, that’s Lennox’s head. They keep it on the mantel. It’s pretty messed up. And that’s pretty much that. It’s a very in-betweeny issue. And fair enough; it’s right smack dab in the middle of this collection, with three more issues to go. But I’ll have to catch up with those next week, because that’s more than enough for now. Check back in the next Wonder Wednesday for what I’m sure will be a whole lot more of these cruel godly high jinks.